This article will teach you how to homestead anywhere! When you hear the word homestead, what do you think of? Do you think of a man in coveralls out in a field sowing corn? Or a woman living in the suburbs gathering eggs from her 3 chickens for breakfast? How about a family living in an apartment in the city that grows tomatoes on their terrace? In today’s world, there are so many variations of homesteading but the core belief is the same. Make it. Grow it. Raise it. Get more of what you need at home instead of running to the store. It doesn’t matter if you live on 100 acres in the country or in the middle of a large city. The “where” isn’t the important part. It’s the “how” that matters. Learning to make more so you buy less is a way of life. A thought process that guides you through your days. Homesteaders live with intention at all times. They do not blindly spend or shop just to shop. They go to the store with a specific need in mind and a list with only enough money to cover that list. 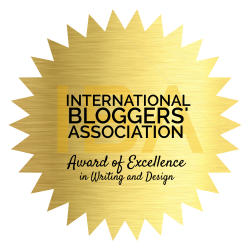 Shopping with intention is a life changer and one I highly recommend to everyone….whether you homestead or not. So, if you want to be more self-sufficient here are a few quick tips to get you on your way to a life of a homesteader. Whether it be shopping for food or clothing, learn to limit your trips to town. One of the biggest perks of homesteading is saving money and the easiest way to save money is to simply stay out of the stores. Plan your trips and shop with intention. You are there to purchase something you NEED and cannot MAKE so get in, get out, and save money. Pare down on what you own. If you don’t treasure it, love it or use it then you don’t need it. I have “declutter” on my to-do list every single week. I hate stuff all over my house because it makes it impossible to find things. If I can’t find what I need I end up buying what I already have. Pare down, clean out, and quit wasting time looking for things and more time creating things. Not sure how to start? Read more here to get awesome simply tips on how to take that first step. This is my favorite way to homestead. I love LOVE gardening. 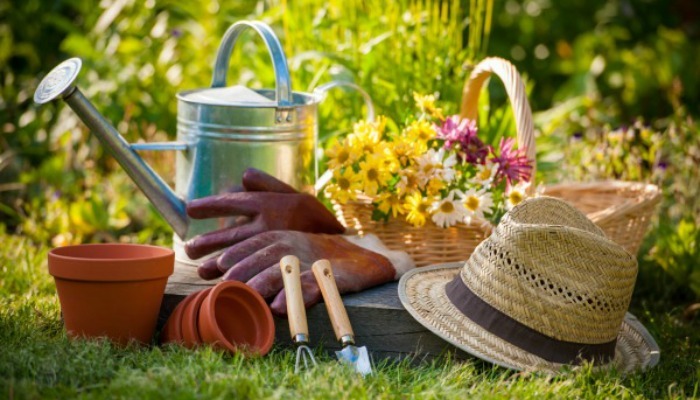 If you are new to gardening, start out small so you do not get overwhelmed. If you Keep it simple you will grow with your garden. Diving in off the deep end will only set yourself up for failure. Plus, you will be amazed at how much you can grow in a small space. You really don’t need a lot to grow enough fresh produce to feed your family. Good news, right!? If you live in the city, container gardening is the perfect solution for you. Check out my Pinterest board that is full of ideas and tips on how to get started. Boxes, buckets, even bags will work perfectly in a small space like a patio or terrace. No more excuses, it’s time to get your tomato on! Make it don’t buy it. This is especially true in the kitchen. Learn to make more so you rely on the stores less. Sure, convenience foods save you loads of time but try not to rely on them. A few items in your pantry for days when you need dinner fast and easy is fine. Use those items for what they were intended for. Convenience. The trick is not to rely on them for every single dinner. Make a meal plan so you know what you are having and take out the guesswork. Fall back in love with your crock pot. I adore my crockpot and aim to use it at least once a week year round. I toss some frozen meat in at breakfast and I have a full meal ready to go at dinner time. Easy. Fast. Super delicious! If making it is just more than you have time for right now, at the very least you can buy homemade. Keep ingredients simple and natural and you will be so thankful. Start easy by only buying natural soaps like these from Reformation Acres. I just love these Farmstead soaps. Made with farm fresh milk (so awesome!!) and herbs you will love them as soon as you try them. I make our own goat milk soap here and the quality you get cannot be matched. Plus I love knowing EXACTLY what we are using and being able to pronounce every ingredient in our soaps. Learning to preserve what you grow is a huge reason to homestead. We all want to be more self-sufficient and what better way than to get the food we eat from our own homes. If you are new to canning and just don’t want to try your hand at it just yet, there are other ways to preserve your food. Dehydrate, freeze and cold storage are all easy and efficient ways to keep food for your family. I work on and off throughout the summer months filling our freezers for the winter. Most produce will freeze wonderfully and it’s so simple to do. Berries and peppers fill our freezers along with diced onions, shredded zucchini, and sugar snap peas. I also do a large amount of freezer corn. The trick here is to plan. For example. Chocolate Zucchini Bread is a fast and favorite breakfast for my family. I know it takes about 25-30 loaves to get us through the winter. To keep that huge chore more manageable I try to make 6 loaves a week until my quota is filled. Having a game plan helps stop the overwhelm. This is so simple to do and whether you are on a well or in the city, it can benefit you to conserve water whenever necessary. If you use a dehumidifier in your basement, don’t dump the water out, use it instead to water your herbs and patio plants. I dump the water into old milk jugs as my humidifier fills up. In the lid, I have holes punched out creating a perfect watering can. Tip: I would not use this water for animals since it can be dirty. Save this water for plants only. If you are filling your sink with warm water to do dishes, fill a couple of clean milk jugs with the cool water while you wait for it to heat up. This water is clean so it can be used to water animals or put it in your fridge to drink later. Put a rain barrel out by your garden and use it to catch rainwater. (You can check this expensive version of RAIN BARREL as a reference on what you can use to make your own.) Cut the top off of an old milk jug making sure to leave the handle intact. This is the perfect water scoop that you can use to water your garden plants. You can also use the barrel water to do a quick hand wash after a weeding session. Use it up, wear it out, do without. I am sure by now you are seeing an underlying theme here. Buy less so you can save more. Tear in your shirt? Mend it rather than replacing it. Broken zipper? It is much cheaper to buy a new zipper and replace it rather than a whole new coat. Hole in the finger of your gloves? Cut off all the fingers and use them when you need warmth but don’t want your hand covered. The point is to completely wear it out before you replace it. Hey, clothes are expensive especially good quality clothes. Make sure they last as long as possible. Sew and mend just don’t throw away!!! Tip: Don’t have a sewing machine? Maybe it is time you invest in one. Yes, the upfront cost will be a hit but the savings you will have over time will be worth every penny spent. You don’t need an expensive machine to do the trick, I love this machine and the cost is very reasonable and an instructional DVD if you are new. Learn to use your Mad Macgyver skills. My favorite part of having a homestead is honing my red necking skills to a point of masterdom. (is that even a word?) I have learned to create something out of nothing so much so that I now feel a master in my field. There is nothing I cannot do with a couple of zip ties and some baler twine. I really should do a redneck farm tour for you all. Even though Hubs cringes at my cheapskate projects, I have found him a time or two pointing out my creations to visitors when he believed I was not looking. Another homestead skill you can do anywhere is making more of what you need. Cleaners can be so toxic even unnecessarily so. Learn to make bathroom cleaner, all-purpose cleaner, even dishwasher, and laundry detergent and control what chemicals you allow into your home. You can find some great recipes on my Pinterest page here. Nothing soothes my soul more than clothes on the line. The site and sound bring me back to a simpler time. I have a line in my yard and even in my basement. Not only does drying your own clothes save energy, but it also saves the life of your clothes as well. 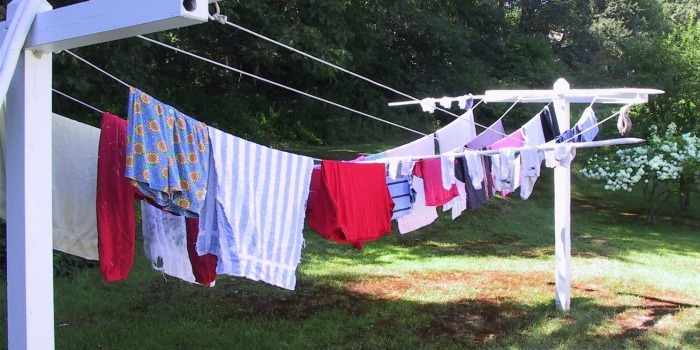 If you are limited on space, you can use a retractable clothesline or a drying rack. Or save your money and find an old broom handle to hand in your basement or laundry room. You would be amazed at how many shirts you can fit on the hanger to dry this way. This is such a great way to cut down on waste and to help your plants at the same time. It is surprising how little room you need to compost. I have a small bucket under my sink for food scraps and a large pile outside our barn. The key to a good compost pile is all in the layering. Alternating green and brown matter keeps things in sync. You can read more about composting here. You do not need a lot of room. A small container will make enough for your patio garden. Like an old trash can or plastic tote. This tip is simple no matter where you live. With the increasing popularity of farm to table, more and more cities are seeing the benefits of farmer’s markets. Nothing is more relaxing than strolling through a market on a Saturday morning purchasing a bounty of fruits and veggies. You will be amazed at the colors of freshly grown fruit. Bright, beautiful and delicious. Another great option is to join a food or garden co-op. My brother lives in the city and is a member of a garden co-op. I was able to visit once and I was just amazed at the quality and ease of getting their freshly grown food. Call your extension office to see if one is available in your area. Not everything you have can be used again, I get that, but don’t just toss it in the trash. Whether it be in a recycling bin, sold at a yard sale, placed into a donation box or given to a friend. Try to get more life out of your things either by you or someone else. Do your part to keep the trash out of the trash bins. You don’t always need to own a tool especially when it requires a one time use. Ask around before you purchase and offer the use of your own tools while you are at it. Homesteading is a community and communities work as a team and help each other out. Don’t just ask for help, offer it too. You will be amazed at what you have to offer others. Don’t keep your talents a secret. Baking, weeding, planting, canning, laundry, are just a few ideas of what you can do for trade or barter. Learn from a simple people. I am amazed time and again from the Amish and how they are able to live a simple life in such a modern world. Even if you adopt just a few of their tips you will not regret it. Their sense of living off the land, making use of what they have and extreme sense of community are all qualities I try to emulate daily in our own home. 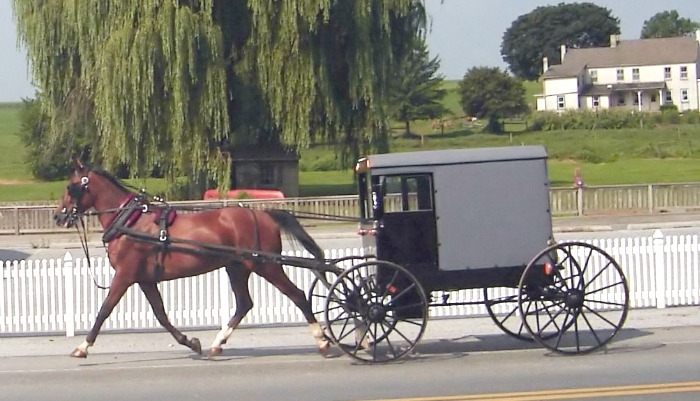 You can read more about the Amish here and hopefully gain some inspiration for your own lives. To me having a homestead is a lifestyle that can be achieved anywhere by anyone. And I am not alone in my beliefs. 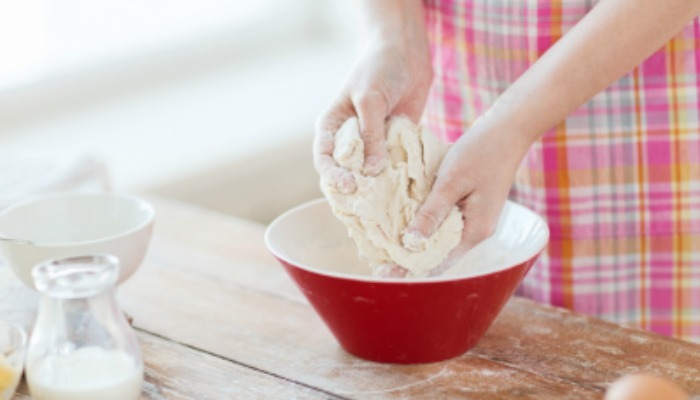 My good friend Jamie over at simplelivingmommy.com has a great post you should check out. 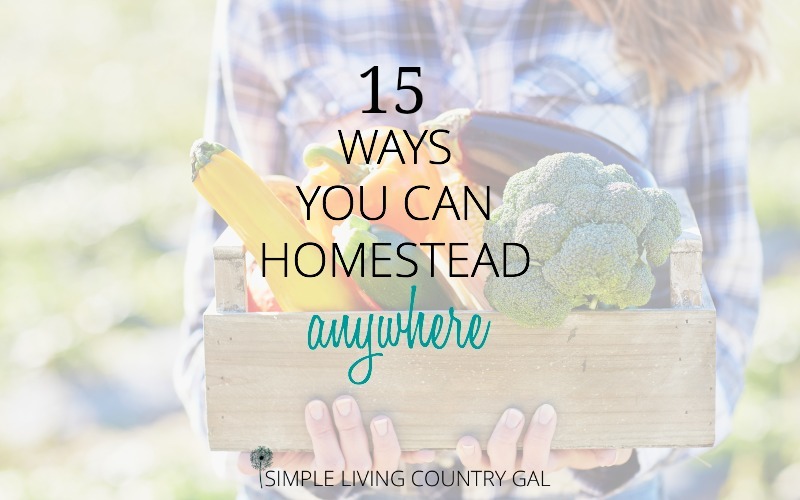 Here are even more ways to homestead wherever you are! Whether you live on 100 acres or in a high rise apartment, homesteading is simple to do at any stage. Follow one or all of these tips to not only achieve your goal of homesteading but also to gain lasting benefits for you and your family. I’ve been reading a book called Money Secrets of the Amish and it’s very eye opening. Even if you think you’ve been fairly frugal, it makes you think about ways you can do even more. We’ve been doing more and more of the suggestions you mention here, and it’s life changing (in a great way!). I adore Amish books but this is one I have not read yet. Thanks so much for suggesting it! Even though my kids are older and I am finding more money in my pockets at the end of the day, I still find myself looking for ways to save. I admire the frugal values of the Amish. These are amazing tips! my favourite is ‘make it not buy it’- I always prefer to DIY things, and its much more fun! I’m definitely a DIY girl, with everything!